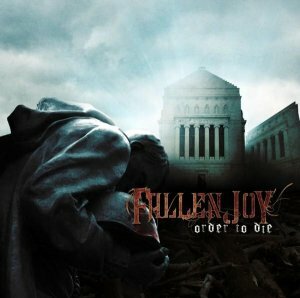 Review: "Fallen Joy: Order to Die" - Sea of Tranquility - The Web Destination for Progressive Music! The press materials for this five-song EP from France's Fallen Joy suggest that fans of Stratovarius will like Order to Die. Um, only if Timo Kotipelto started singing like Satan. To be fair, Amon Amarth and Gorgoroth also are cited, and those comparisons are more on target. This is dense, dark and aggressive melodic metal with sometimes-slithering, sometimes-phlegmy vocals that will appeal to adventurous prog-metal fans. From the symphonic opening instrumental "Morituri Te Salutant" and through the scorching title track to the doomy seven-minute closer "Voyage au Bout de la Nuit," Fallen Joy displays tremendous musical depth. This is far from your traditional progressive-tinged death metal, with songs taking unexpected turns. The smooth melodic solos from dual guitarists Victor Gallot-Lavell�e and Antoine Brisson raise "Hoisting the Black Flag," and the speed-metal riffs that open "Seeds of Tyranny" quickly evolve into a tech-metal slam-fest. With references to "blood piss" and women and children eating their own eyes, this is not uplifting stuff. Perhaps it's a good thing the lyrics are barely discernible.